I haven't been at my current job long enough yet, apparently, because people still make the mistake of asking me what are you doing this weekend? I say that it is a mistake to ask me about my weekend plans because that question is supposed to be followed with an ordinary answer like going to see a movie or yardwork. But when you ask me about my weekend plans, you're likely to get an answer like this: well, we'll be pretty busy getting ready for our pig auction. Husband has to give haircuts to 100+ pigs. Yes, you read that right. Pigs get haircuts. Husband is grooming them for the pig auction (we call it a sale) that we are having on Saturday. In the market for a pig? Head over here. Pigs have short, coarse hair that in days of old was used to make brushes (and maybe still today). Husband and other pig farmers clip the hair of the pigs shorter to make them look more appealing to potential buyers, who in this case are 4-H kids and parents looking for a hog to take to the county or state fairs. What are the steps in cutting a pig's hair? And do you have photos? I thought you'd never ask. The pigs are then snared at the nose to keep them from running off and then Husband uses animal grooming clippers to clip all the hair on the pig's body. The pigs, surprisingly, are not keen to have their normal routine of pooping, chewing on the fence, eating, sleeping, and more pooping disturbed. While the haircut does not harm them, they do not like the process and tend to squeal. 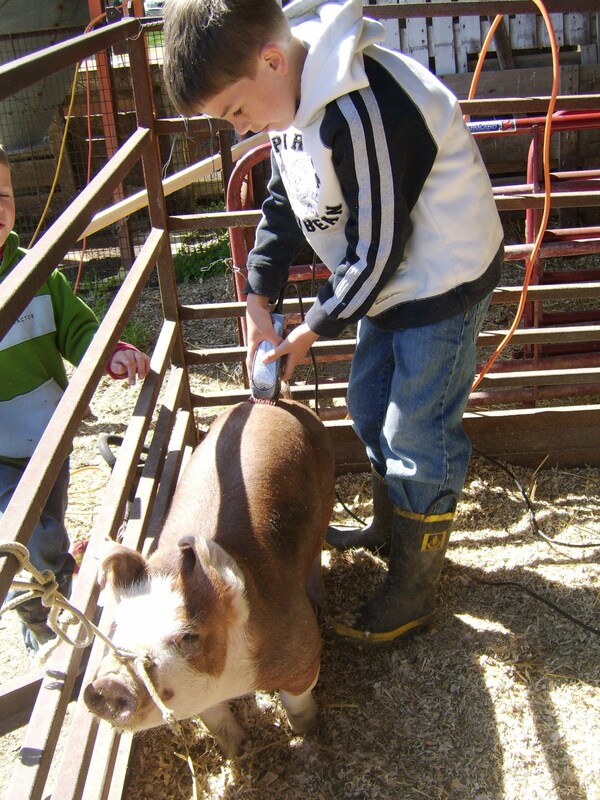 Proving again that our children have very different milestones than most kids, today was a big day for Ryan as he clipped his very first pig. Claude' was kind enough to guide him through the process while Husband entertained some potential buyers from out of state. Justin maintained a supervisory role while Morgan hid in the house to avoid the squealing. Husband and Claude' clipped about 35 pigs this weekend, only 75 more to go! Fortunately, we have the services of Claude' all week. He and Husband will get all the pigs groomed in time for our sale, I'm sure. Stay tuned for next weekend's adventures, which include bathing 100+ pigs (Husband and boys) clerking a pig auction with my in-laws (me), and closing down Frisch's in Eaton (all). Thank you so much to share your interesting weekend plan and I think you said correctly in here. So we also find more information from here those we need to know to work in the weekend day.